AFFANDI | Geringer Art, Ltd.
AFFANDI (Javanese, 1907- May 23, 1990). The painter Affandi has been called a “towering figure in the history of Indonesian modern art.” Affandi’s paintings often display his emotional responses to the lives of a people struggling to move out of poverty towards dignity. Affandi was born in Cierbon, West Java in 1907, the son of a surveyor at a local sugar factory. After finishing his secondary education he found himself increasingly interested in painting, and in his mid-twenties he emerged as a self-taught artist. During his early years he taught school, collected tickets at a movie theater and worked as a house painter, saving leftover paint for his canvases. In the 1930s Affandi became affiliated with an artist’s group called “Lima Bandung.” The other artists in the group were Hendra Gunawan, Barli, Sudarso, and Wahdi. The “Lima Bandung” went on to become highly influential in the development of Indonesian modern art. In 1943, during the Japanese occupation of Indonesia, Affandi held his first solo exhibition in Djakarta. After the proclamation of Indonesian independence on August 17, 1945, Affandi became involved in making posters that evoked the struggle of the Indonesian people against Dutch colonialism. Other artists active in the creation of political posters included S. Soedjojono, Dullah, Trubus, and Chairil Anwar. In late 1945 Affandi moved to Yogyakarta to establish a society of artist’s communities. This society eventually became the “Indonesian Young Artists Society.” In 1947, Affandi founded the “People’s Painters” with Hendra Gunawan and Kusnadi, to provide learning opportunities to a younger generation is of artists hungry for artistic education. Then in 1948, Affandi moved back to Jakarta and co-founded association “Indonesian Painters Association.” These groups were originally connected to the Indonesian Communist Party, which Affandi later cut his ties with. In 1949 Affandi received a grant from the government of India where he then lived for 2 years. There, Affandi painted actively and held exhibitions in major cities in India through 1951. An artistic breakthrough occurred in his work of the early 1950s when he began to squeeze paint directly from the tube. The resulting paintings, which have an affinity with the works of Van Gogh, are distinctly expressionistic and emotionally resonant. Affandi’s spontaneous squeezed paint method soon became essential to his signature style. A traveling exhibition of Affandi’s works from this era visited European cities including London, Amsterdam, Brussels, Paris and Rome. Upon his return to Indonesia, Affandi was appointed by the Indonesian government to represent Indonesia in international Biennales exhibitions in Sao Paulo (1953), Venice (1954), and Sao Paulo (1956). 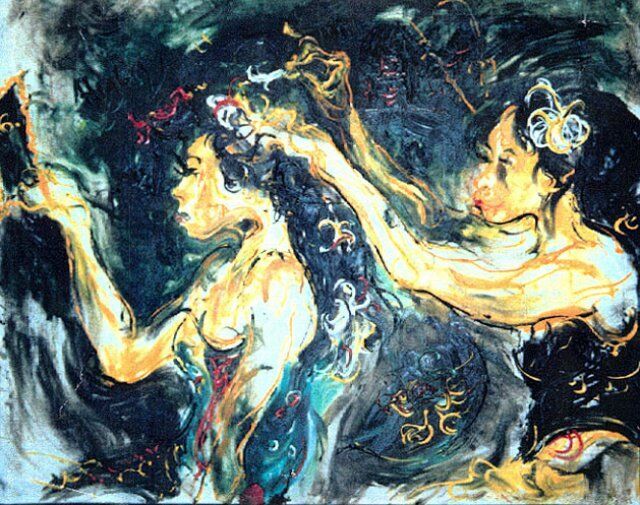 Beginning in 1955 Affandi taught at the Indonesian Academy of Fine Arts in Yogyakarta. After participating in international exhibitions in Brazil and Italy, Affandi received a 1957 scholarship from the U. S. government to study arts education. He was made an Honorary Professor of Painting by Ohio State University, and in 1974 was awarded an honorary doctorate by the University of Singapore. He also received the Peace Award from the Dag Hammarskjoeld Foundation in 1977, and the title of Grand Maestro in Florence, Italy. By the time of his death it is estimated that Affandi had created over 2,000 oil paintings. He also left sculptures in both cement and clay. Affandi’s unique home, which features a banana shaped roof sits on the bank of the Gajah Wong River in Yogyakarta. It is now a museum displaying over 300 of the artist’s paintings. Upon his death in 1990, Affandi was buried in the museum complex. Do you have a piece by this artist that you are interested in evaluating or selling? Site Contents © 2019 Geringer Art, Ltd..